Plasma Cutters - Keen Compressed Gas Co. 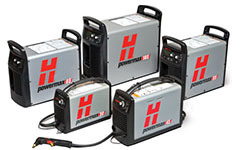 Keen Compressed Gas Co. carries the top brands in plasma cutters. Plasma Cutting can be simply put as an electrically heated gas stream. This stream is used to transfer energy to a conductive material, and is typically formed by forcing a gas such as nitrogen, oxygen, argon or even air through a narrow nozzle. An external power supply adds energy to the gas flow to ionize it producing a plasma arc. The stream then becomes really dense and moves extremely fast. The resulting stream can melt and blow through most metals quite easily, and is referred to as the plasma torch. Plasma Cutting is the fastest cutting process on carbon steel, aluminum and stainless steel. This process can be used for precision cutting on gauge material up to 6” thick stainless. Arc starting circuit – typically a high frequency generator circuit that products an AC voltage. Torch – serves as a holder for the nozzle and electrode, also provides cooling to these parts. The nozzle and electrode maintain the plasma stream.